Management APIs reflect product features. If you check the latest API reference, you will find out that quite a few properties and methods of the LicenseManager managed object are deprecated and added (If you use managed object browser to view the deprecated properties, they may be null or literally “unset”). A new managed object LicenseAssignmentManager is added for assigning licenses to entities like vCenter or ESX/ESXi. Although I covered the changes of vSphere 4 in appendix of my book published by Prentice Hall, they are pretty high level. In this post, I will give a detailed introduction on the changes related to licensing APIs, and how you should use the new licensing APIs effectively. The change in LicenseManager is dramatic in that whatever there before are deprecated and all the current ones are newly added. You can think of the LicenseManager as a brand new managed object except that it inherits the old name. I will not include the deprecated in the following discussion. If you are interested in them, please check them out in either API ref or my book. licenseKey xsd:string Key for the license. 25 character serial number. name xsd:string Display name for the license, “vSphere 4 Enterprise Plus”, “vCenter Server 4 Standard”. Seemingly easy and simple, the properties represent a learning curve here. As you can guess from its type, any item in the array can be any value (any type), meaning you put any data there. In practice, you can find string, KeyValue, long, date, and even LicenseManagerLicenseInfo (I don’t have explanation why another copy of LicenseManagerLicenseInfo is embedded in itself) as values. This newly added managed object is responsible to assign/remove/query licenses to particular entities like vCenter or ESX/ESXi. The following code snippet shows what it does exactly. One important thing here is to understand the value/format for the entityId. For ESX/ESXi server, it is the value of its MOR, for example, “host-21”; for vCenter server, it’s the value of the instanceUuid added into AboutInfo data object since 4.0, for example, “BA9CE658-75F7-4A99-ACE6-99EB1376B94A”. You may be wondering how you can get all the assignments, meaning which license keys assigned to which entities. If it’s just a VC, it’s easy because you just get its instanceID and call the queryAssignedLicenses() method. For ESX/ESXi servers, they could be hundreds. Do you have to first grab all of their MOR values and call one by one for hundreds of times? Luckily, you don’t have to. The parameter to the queryAssignedLicenses() is optional, and you can bypass that (In VI Java API, you use null in place of entityId; in MOB, you leave it as empty string). As a result, you will get all the mappings in the returned LicenseAssignmentManagerLicenseAssignment array. The following table summarizes the properties in the data object. scope* xsd:string Scope of the entityId. If ESX/ESXi, it’s the instanceId of the vCenter that manages it; if vCenter, it’s null or unset. 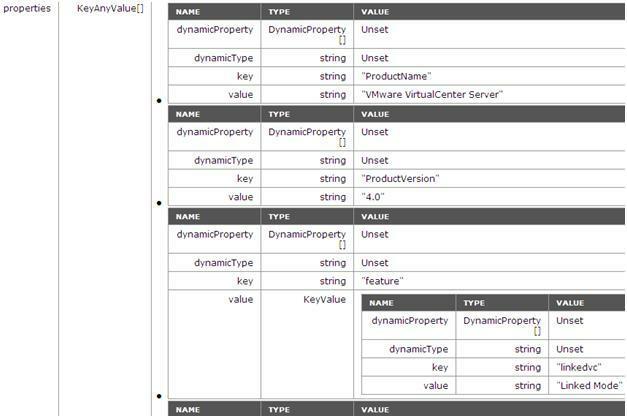 Again, you see properties defined as KeyAnyValue, which can hold any types of values. The most important thing is the “inUseFeatures” key/value pairs. With the queryAssignedLicenses(), you can retrieve all the assignments in a single call. In a fairly big environment where a license key is assigned to many ESXi servers, you have a big array returned, most of which are duplicated (see the assignedLicense property). This is of course not an ideal case but a compromise given that the method is intended for single entity at a time. You’ve learned the new license model and related APIs since vSphere 4. Just like learning any APIs, it’s always good to show some samples. That is what I will do. Please stay tuned for next post with samples based on VI Java API. If you haven’t tried VI Java API yet, it’s time to do so. Be ready for licensing samples in a future post. Is not returning anything. I agree with you that it works via mob, when not giving any value for entityID it prints out everything. In powercli it just does not returning anything. Enjoyed, belatedly, this post. I was the part of the team that redesigned and implemented VIM Licensing in VI4. Just one point to add which is vCenter is the authoritative truth for a given ESX systems license and not the ESX host (ssh to esx, vim-cmd vimsvc/license –show or from mob or vim api LicenseManager object). Any attempt to change a license on an ESX Host will be overridden by VC once it discovers any direct change. I was predicting that VMware would sell some of their new ftaeures separately. I heard rumors they would charge $250 per VM for FT and sell host profiles as a separate configuration management product. That’s what MSFT would have done if they had the first-mover advantage on new ftaeures like that. So I don’t think it’s unreasonable what VMware has done with their new licensing. Plus I’m expecting to get a lot more VMs per server with the new version 4, so net-net it’ll be less expensive than 3.5.